A striking piece of art, this card is sure to delight anyone lucky enough to receive it this holiday season. The Christmas card features a rich red background with silver ornaments upon it. The hanging decorations are accented with silver foil and gems, giving the card a fanciful shimmer! 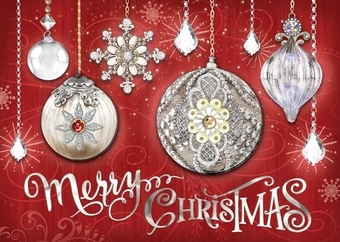 "Merry Christmas" is written across the bottom, and on the inside is the phrase, "May Your Holidays Sparkle and Shine".